Ahmed Imtiaz Bulbul ranks among the few film music composers in the country whose compositions have been box-office hits. His unique compositions such as Amar buker moddhey khaney, Amar shara deho kheyo go mati, Porey na chokher polok, Tomaye dekhle mone hoy, Ammajan, E jogote tumi ami ekjon, Nodi chay choltey and many others are examples of evergreen film songs. 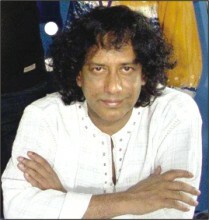 In his long music career, Bulbul has composed songs for 350 movies. And he is the lyricist of most of these songs. Bulbul embarked on his music career when he was a teenager. He used to play the guitar at Hotel Sheraton in the 1960s, which was the source of his bread and butter. Later he formed a band named 'Aftermath'. Simultaneously he used to play guitar for film songs. In the '70s he emerged as a music composer of patriotic songs for BTV. Bulbul said, "As I'm a freedom fighter, after Independence I used to compose musical programmes featuring patriotic songs for BTV. The songs were rendered by Sabina Yasmin. Some of these songs include Shob kota janala, Shundar shubarno tarunyo labonyo, Uttar dakkhin purbo poshchim, O amar aat koti phul, O majhi nao chhaira de. For eight years BTV used my composition Shob kota janala before the national news during the 1980s. That time I toyed with the idea of dedicating my life to the composition of patriotic songs. But, BTV didn't even pay me a taka for playing my composition before the news." As a witness to social turmoil, corruption as well as lack of due for the music composers in BTV, Bulbul decided to change course and give more time to the composition for films and cassettes. He started composing music for films with Megh Bijli Badol (1978). Songs from the movie titled Nayaner Alo catapulted him to the limelight. To quote Bulbul, "All six songs of the movie Nayaner Alo have been hits in the movie industry. I got several awards in 1984, including the national award for the movie. Samina Chowdhury and Andrew Kishore also became popular artistes through these songs." And that was the beginning of his successful career in film music. Bulbul said, "Even in these days when the movie industry is struggling, songs composed by me are usually hits." Bulbul thinks that his sense of music and ability to relate to the masses are the secret behind his popularity. To quote him, "With the advancement of time and development of technical aspects a music composer should modify the style to stay contemporary. In course of doing that she or he must have the keen idea of the customs and culture as well as a sharp idea to feel the spirit of the people." Besides film songs, music albums by the seasoned composer have also won applause. Bulbul said, "I compose my songs as well as lyrics according to the presentation style and calibre of the artists. All songs do not match the singer's voice. I have a unique approach for different artistes. I ask them whether they have a preference when working on a particular album. For example Kumar Bishwajit is very choosy. He tells me what kind of compositions and lyrics he wants. Getting on to his wavelength, I try to come up with compositions that would best suit him. I have just one condition -- the singer must be melodious. I do the rest to make him or her a popular singer." In fact, it is widely acknowledged that Bulbul has a keen eye for new talent. Renowned singers of the country such as Kumar Bishwajit, Samina Chowdhury, Andrew Kishore, Baby Naznin, Monir Khan and others have come into the limelight singing songs written and composed by him. Bulbul is one of the judges in the much hyped talent hunt Closeup 1 Tomakei Khujchhe Bangladesh. According to him, "There may be many questions related to the talent hunts, but I feel the talent hunt is a major platform for young artistes. In earlier days younger singers lacked exposure. As a result many misused the urge of the young to become singers. The talent hunt provides them with exposure and I'm working with a production company to compose songs for the winners of the contest." Bulbul's contribution to the music industry has earned him several awards including the national award, president award and 'Shikha Anirban Award' -- the highest honour instituted by Bangladesh Armed Forces. Moreover he is an 11-time winner of the Bachsas award.